Singapore’s central bank, the Monetary Authority of Singapore, kept policy unchanged on Friday and lowered its inflation forecast, pointing to slowing economic growth in the city-state. Gross domestic product (GDP) growth in Singapore slowed to 1.3 percent on-year in the first quarter, from 1.9 percent in the fourth quarter, according to preliminary data released Friday by Singapore’s Ministry of Trade and Industry (MTI). 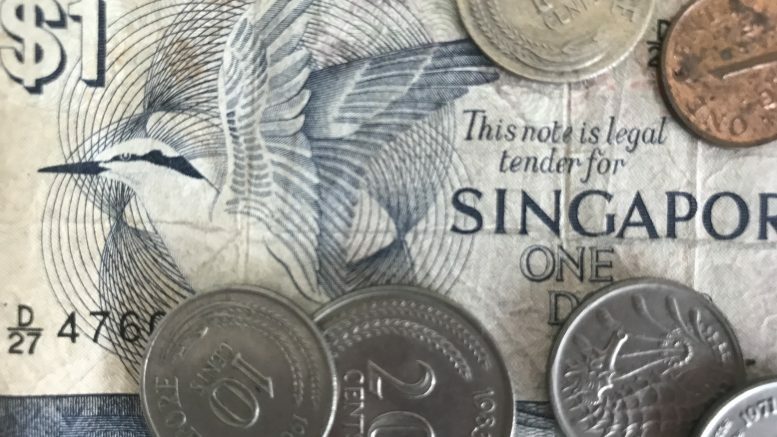 The MAS said on Friday it was keeping the current rate of appreciation for the Singapore dollar nominal effective exchange rate, or NEER, policy band unchanged, and left the band’s width and the center level untouched. Instead of interest rates, the MAS uses the Singapore dollar exchange rate to set policy. That’s due to the island nation’s open economy and small size. Monetary policy is set by adjusting the Singapore dollar’s trading band, which is based on an undisclosed basket of currencies weighted to trade levels with the country. “GDP growth in the Singapore economy has eased, bringing the level of output closer to its underlying potential. Despite some pickup in labor costs, inflationary pressures are mild and should remain contained,” the MAS said in its statement on Friday. “An acceleration in inflationary pressures is unlikely against the backdrop of slower GDP growth, uncertainties in the global economy, as well as the continuing restraining effects of MAS’ monetary policy tightening in 2018,” it added. It said it expected Singapore’s GDP growth for the full year to come in “slightly below the mid-point” of its 1.5 percent to 3.5 percent forecast range. “The pace of growth will be slightly below potential this year, following two years when it was above trend,” the MAS said. The central bank also lowered its forecast for core inflation, which excludes the costs of accommodation and private road transport, to 1 percent to 2 percent from the previous 1.5 percent to 2.5 percent range. For the January-to-February period, core inflation fell to 1.6 percent on-year, from 1.8 percent in the fourth quarter, it noted. It said it expected core inflation to come in near the mid-point of the revised forecast range. “Core inflation has come in lower than projected due to weaker global oil prices and a stronger impact from the liberalization of the retail electricity market,” the MAS said. The Open Electricity Market has produced a sharper-than-expected drop in electricity prices as more households than expected switched to lower-priced plans, with the take-up rate likely to increase in the months ahead, the MAS said. The MAS has official policy-setting meetings only twice a year, in October and April, although on rare occasions, it has taken action between meetings.